Magnuson Hotels, the world’s largest independent hotel group, announced today the complete rebranding of the Magnuson Hotel & Meridian Convention Center. 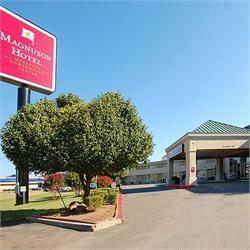 Formerly a franchise of Choice Hotels International, this 236-room hotel seeks to upgrade its local, regional and national market position through its affiliation with the Magnuson Hotels brand designation. “Magnuson Hotels is proud to welcome General Manager Gary Burleson and his staff, and are committed to increasing their market presence and reservations,” stated Thomas Magnuson, CEO. As a Magnuson Hotels affiliate, the Magnuson Hotel & Meridian Convention Center will receive complete brand representation across North America and the UK, without the costs and requirements of franchise brand affiliation.